I had been considering getting my genome analyzed by 23andMe, the only commercial, non-prescription, and affordable source for genome analysis. But what they do isn't exactly sequencing, it's genotyping (and it's significantly less expensive). While sequencing reads every one of your 3 billion nucleotide base pairs, genotyping only examines the ones we know are different in different people. It's a little shortcut, see, but the differences they know to look for are based on a relatively small group of people whose genomes have been completely sequenced. The Personal Genome Project aims to identify more differences (called polymorphisms) by examining a larger sample of completely sequenced genomes. 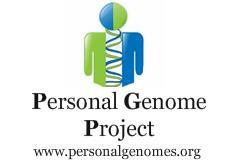 So when I heard about the Personal Genome Project (over a year ago), I signed up! It's an involved process, including creating and handing over access to a Google Health profile (which would be a lot more revealing if it actually contained any health information besides my age, height, and heart rate). My personal genome profile (which includes health information will be (is) public, but without my name or identifying information associated. At some point I will also need to travel to Boston to give a blood sample and a skin sample. I don't pretend that I'll gain too much exciting information from having my genome sequenced. It will almost certainly say that I am likely of European descent, and I have a higher than average susceptibility to skin cancer. That's not really news. It may reveal an unexpected mutation, but I've of course been cautioned not to use the information in lieu of medical care. No, I'm mainly doing it because I think it would be cool to have my genome sequence in digital form (maybe I'll carry it around on a USB flash drive). Also because when I was in 10th grade I wanted to work on the Human Genome Project, and realized that by the time I was qualified to do so, it would be complete. (And it was; the project was announced complete while I was in college.) This is my way of participating in the next step of human genomics research.